By CNN'S DEVAN COLE AND ALLA ESCHENKO CONTRIBUTED TO THIS REPORT. 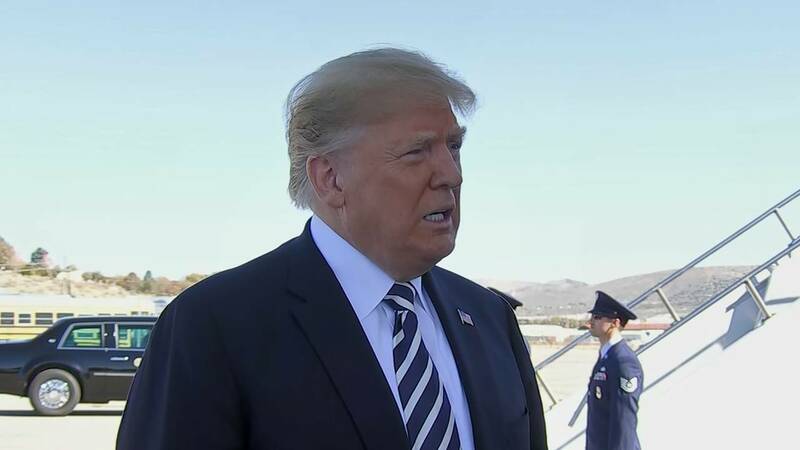 (CNN) - President Donald Trump announced Saturday that the US is pulling out of the landmark Intermediate-Range Nuclear Forces Treaty with Russia, a decades-old agreement that has drawn the ire of the President. "But Russia has not, unfortunately, honored the agreement. So we're going to terminate the agreement. We're gonna pull out," he said of the agreement, which was signed in December 1987 by former President Ronald Reagan and former USSR President Mikhail Gorbachev. Following the announcement, Russia's state-run news agency, RIA Novosti, reported that Russian President Vladimir Putin plans to discuss the decision with US national security adviser John Bolton when he visits Russia this week. According to the report, the Kremlin's spokesman, Dmitry Peskov, said, "It's likely that an explanation from the US will be required following the latest scandalous statements." The treaty forced both countries to eliminate ground-launched ballistic and cruise missiles with ranges between approximately 300 and 3,400 miles. It offered a blanket of protection to the United States' European allies and marked a watershed agreement between two nations at the center of the arms race during the Cold War. "I suspect our European allies right now are none too happy about hearing that President Trump intends to pull out of it," he said. In 2014, CNN reported that the US had accused Russia of violating the INF Treaty, citing cruise missile tests that dated to 2008. CNN reported in 2014 that the United States at the time informed its NATO allies of Russia's suspected breach. However, it wasn't until recently that NATO officially confirmed Russia's activity constituted a likely violation. NATO Secretary General Jens Stoltenberg said earlier this month that the military alliance remained "concerned about Russia's lack of respect for its international commitments, including the Intermediate-Range Nuclear Forces Treaty, the INF Treaty." "This treaty abolishes a whole category of weapons and is a crucial element of our security," Stoltenberg said, speaking at a defense ministers' meeting. "Now this treaty is in danger because of Russia's actions." He continued, "After years of denials, Russia recently acknowledged the existence of a new missile system, called 9M729. Russia has not provided any credible answers on this new missile. All allies agree that the most plausible assessment would be that Russia is in violation of the treaty. It is therefore urgent that Russia addresses these concerns in a substantial and transparent manner." Moscow's failure to adhere to the agreement was also addressed in the most recent Nuclear Posture Review published by the Defense Department in February, which said Russia "continues to violate a series of arms control treaties and commitments." "In a broader context, Russia is either rejecting or avoiding its obligations and commitments under numerous agreements and has rebuffed U.S. efforts to follow the New Strategic Arms Reduction Treaty (START) with another round of negotiated reductions and to pursue reductions in non-strategic nuclear forces." "I don't think we're at the stage right now that if we pull out of the INF Treaty, you've got to go sort of build a bunker in your backyard," Kirby said. "I don't think we're at that stage at all," he said. "But I do think, if we pull out, we really do need to think about how we are going to, right now because we don't have the same capability as the Russians have with this particular missile. How are we going to try and counter that? How are we going to try and help deter use of it on the continent of Europe?" "Unless Russia comes to us and China comes to us and they all come to us and say, 'Let's really get smart and let's none of us develop those weapons.' But if Russia's doing it and if China's doing it and we're adhering to the agreement, that's unacceptable," Trump said. In 2017, the head of US Pacific Command, Adm. Harry Harris, told Congress that approximately 95% of China's missile force would violate the INF Treaty if they were part of the agreement. "This fact is significant because the U.S. has no comparable capability due to our adherence to the Intermediate Range Nuclear Forces (INF) Treaty with Russia," Harris said in a statement to the Senate Armed Services Committee. "This gives Putin an excuse to just continue doing what he's doing, only doing it more blatantly," Kirby said. Outspoken Russian senator Alexey Pushkov tweeted Sunday that the "United States is bringing the world back to the Cold War" in reaction to Trump's decision, which he called a "massive blow to the entire system of strategic stability in the world." Senior Russian lawmaker Konstantin Kosachev warned on his Facebook page that "the consequences would be truly catastrophic." However, he said it's not official that the US has pulled out of the INF, saying "it's still possible to consider Trump's statement as continuous blackmail rather than a completed legal act."